Sporting occasions are renowned for creating an atmosphere and buzz. But in the age of technology, how can this level of excitement and experience be taken to the next level? Every fan would love to walk out onto the pitch at their team’s stadium, but for obvious reasons, it just isn’t possible. However, through using virtual reality (VR), they can experience the next best thing. From interactive screens to (almost) being involved in the game, we’ve taken a look at the changing face of the sporting experience and how, as a digital solutions provider, UXG can help enhance your event. The days of going to watch sport purely for the sport are long gone. In the 21st century, it’s about the all-round experience, from the moment you arrive at the event or stadium to the moment you leave. Perhaps influenced by the social media generations, fans want something they can interact and engage with to share amongst their friends and followers, so it’s down to the sporting clubs and event organisers to deliver. That’s where digital solutions can become a valuable asset. Fan parks have also been a prominent feature, but to captivate the sporting crowd, tech and innovation can help take these environments to the next level. This isn’t a one size fits all situation – the digital displays need to meet the needs and interests of the audience. Let’s take football as the first example. Having digital screens around the stadium where fans can see the latest scores, team sheets and league tables is a good place to start. Yet this digital transformation can be taken further. Video gaming walls can be used for virtual players to show off their own skills. For further engagement, having an interactive “penalty shoot-out” digital display wall, using sensory technology to see the flight path of the ball gives fans something to to interact with pre-match. The same type of innovation can be incorporated into rugby grounds, with a conversion challenge set- up. Cricket can adopt the screens for users to bowl an over at their favourite batsman, and tennis fans could get a taste of the action with a digital centre court game. This digitalisation of the fan park can create an engaging atmosphere for attendees. VR in sporting events can bolster the experience through creating an engaging platform for fans to immerse themselves in. By using the tech, users can become a part of the entire sporting event – for example, meeting up with the players before the game, being on the bus to the stadium, being involved in the team talk and walking onto the pitch. Through collecting the footage, fans can even realise their dream of being a part of the action on the pitch with their favourite players. Especially for the younger generation of sporting fans, this digital solution is one that can bring a whole new edge to the sports industry. 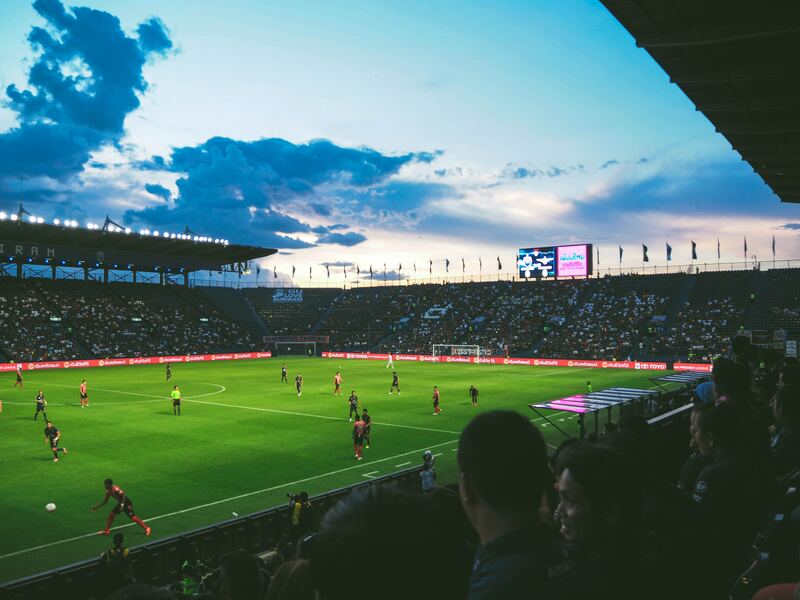 Having digital solutions at sporting events not only has customer benefits, but also can be the perfect opportunity to benefit from a commercial perspective. Having larger displays and screens within sporting fan parks and stadium means more eyes can see the content that is being displayed – whether it’s messaging about an upcoming fixture or the offer you have on refreshments. It’s about maximising your marketing output through broadcasting your other offerings, outside of the sporting event taking place. Using this sort of display could even be used for telling attendees which bars and food vendors are least busy. Or for a more commercial push, could broadcast “flash” sales, where official merchandise is discounted at certain parts of the game – perhaps something suited to the longer form game of cricket. Having innovative digital signage can also act as a key selling point for potential advertising partners. Whether it’s on large screens on the outside of grounds or digital hoardings, which have become more popular of recent times, this space can be gold for affiliates. Taking the initiative to invest can have a positive long-term impact financially. To stay ahead of the curve, sports stadia and events need to adopt tech to meet the demands of fans pre, during and post-match. But by investing in the right digital solutions, clubs and organisers can create an engaging and immersive environment for all spectators to enjoy. Find out more on how UXG can help provide you with the perfect digital solutions for your sporting environment, click here.